Se voce esta aqui por causa da receita do brinquedo aumentador de mundo que dropa desse npc aí, bem, eu consegui ela indo 4 vezes na masmorra (matando todos na área chamada "fabrica" e depois saindo da masmorra e reiniciando ela). É baixo a chance de saque mas tem muitos desses npcs na mesma sala entao fica facil dropar. Muita gente tem dificuldade em entrar nessa masmorra e nas outras desse mapa andando, para entrar na masmorra que tem os npcs pra dropar a receita, voce precisa ir até a montanha rocha negra, em reinos do leste e daí ir perto do npc que te teleporta para o núcleo derretido (raide) daí entao tem uma passagem perto dele, é so entrar. Caso tenha alguma duvida, abra o mapa que neste lugar o mapa muda e aparece o caminho pra masmorra... Até mais! All the engineers who started after BC would appreciate a run through on how a lvl 70 can get to these guys (with and without a shadowforge key) to farm them for their drops. Guide: Enter the BRT (1) and follow the red line. You will need now to use the Shadowforge Key on the East Garrison Door to open it (2). 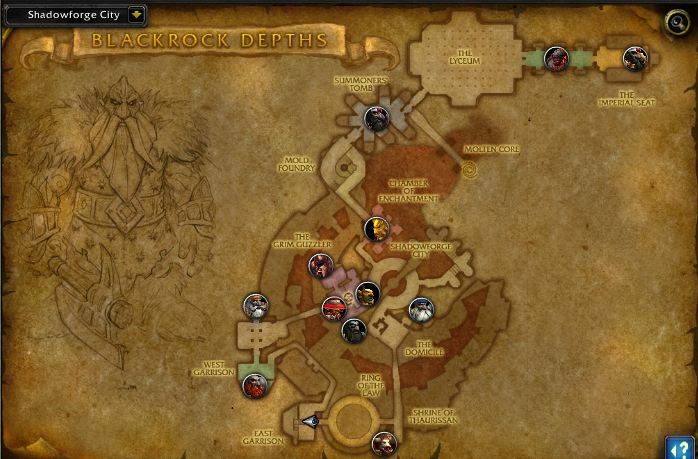 Follow the red line furthermore until you reach the Shadowforge Lock (3). There you will have to use the Shadowforge Key again. Otherwise you can't pass number 4. Follow the red line until you reach the room which is marked with number 5. There you can see the Weapon Technicions. Sorry for my bad english (I am german^^). 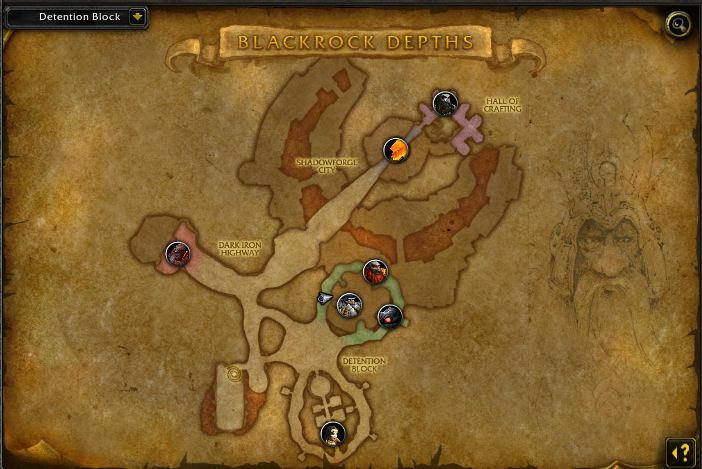 These mobs can be found in multiple places in BRD, not just before Golem Lord Argelmach. But yes, that is the place were the most of them are. If you aren't willing to figure out how to navigate this place to reach the engineering halls where tons of these guys hang out, there is an alternative: Once inside, take the drill to "Just past the Grim Guzzler", you will see 2-3 groups of various bad guys hanging out. You can find a few Weapon Technicians in these groups. Kill them all, hope you get lucky. Take the drill back to the Entrance. leave, reset dungeon, repeat. Of course, it's probably smarter to just make your way to the engineering halls (which I'm sure plenty of other guides already exist for), but if you have a REALLY bad sense of direction, this can work too. By the way, it's not hard to use the drill to get to groups on the other side as well, but I'm afraid there are no Weapon Technicians in those groups you see over there. Although I was up-voted for this comment and appreciate it, I feel I may have over-stated the farmability of this method. After trying it myself several more times, I've generally found that not enough Weapon Technicians spawn between the two groups, typically no more than 5 total (if you're lucky), sometimes none at all. As keys have been removed from the game this will be a basic walk through to get to the engineers in front of Golem Lord. As you enter the dungeon there is a gate to the left, go through. The gate to the right, go through that. Go through the door on the left, next to the troll. Run over to the "wheel" hanging from the ceiling and click the lever. Turn around and go up the ramp and head to the left. This hallway turns to the left and leads to the west garrison. Keep following the path to the left until the room opens up again, make two quick rights and you will see Golem Lord Argelmach in the distance. Down the ramp to both the left and right are the Engineers. If you turn to the right you can see a path that leads to the Grim Guzzler. In here if you kill Plugger Spazzring you will engage Phalanx and a few other mobs that come through the door. Once you've killed them you can proceed through the door and down the ramp to kill a few more Engineers. Take the mole machine at the end of this platform back to the entrance, port out, reset. rinse, repeat until you have your patterns. On my 90 Shadow Priest with Angelic Feather I was able to make an entire lap in just about 3 minutes. If you have Direbrew's Remote and don't mind farming them a bit slower, you can get to these mobs very fast using it. Just go right out of the bar, across the bridge and you'll end up in the room with the Technicians. Took me all of two runs to get the patterns I wanted from these guys. Word of advice (for what it's worth since it's nothing official), if you're max level or anywhere near, kill these guys and loot them one at a time. I have a feeling you get more opportunities at rarer loot the more often you kill and loot each and every one of the mobs you're after, something about rolling the dice more often. Nothing official here, just a feeling and me with some good results going that way instead of mass killing everything with strong AoE spells/attacks. You milleage may vary. Why can't they use better map layout Picture , when you are between floors. Instead on First floor and second floor you see Picture. set Fan of Knives as first spell, Burst of Speed as second spell. Esse PNJ pode ser encontrado em Abismo Rocha Negra (2).